Sample specs are provided as a starting point for specification writers to use for Heavy Timber, Post & Beam, Timber Frame and Section 06130 projects. Structural design, fabrication and installation of heavy timber beams, columns, & trusses.Perform all work required to properly complete the heavy timber work as shown on the drawings and as specified herein. 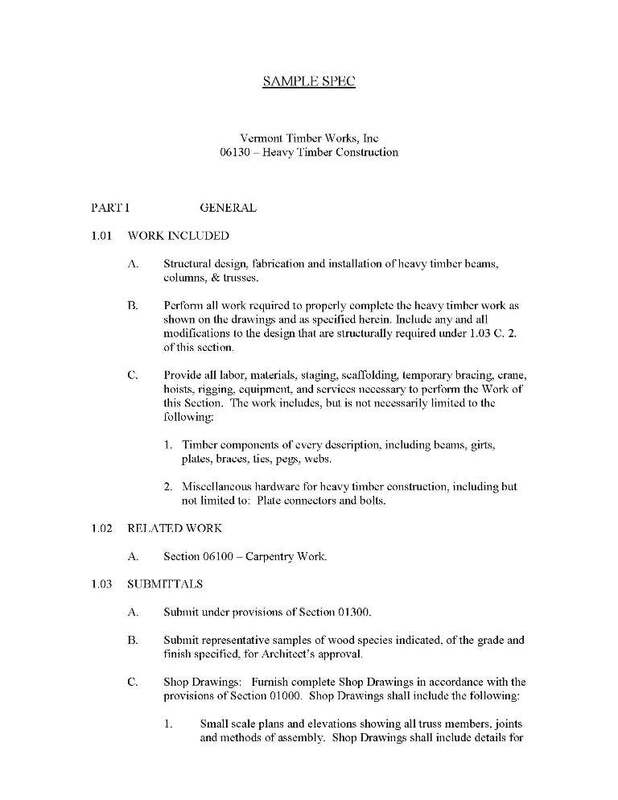 Include any and all modifications to the design that are structurally required under 1.03 C. 2. of this section. Timber components of every description, including beams, girts, plates, braces, ties, pegs, webs. 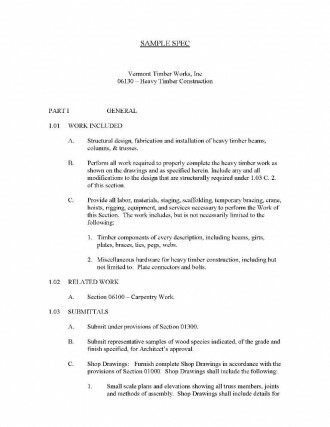 Section 06100 – Carpentry Work. Submit representative samples of wood species indicated, of the grade and finish specified, for Architect’s approval. Small scale plans and elevations showing all truss members, joints and methods of assembly. Shop Drawings shall include details for every member and connection and shall show connector plates, pegs, mortises, tenons, lengths, angles of cut, etc. 2. Shop Drawings shall include stress analysis and joint design by a practicing registered professional engineer with structural engineering credentials, licensed to practice in the state of (fill in state) . The Shop Drawings shall bear the seal of the registered professional engineer. Truss design shall provide the required stability and resistance to gravity loads. No trusses shall be ordered or fabricated prior to the approval of the Shop Drawings by the Architect. The Contractor shall obtain and verify all measurements and conditions at the building as required for the proper installation of his work. He shall be responsible for the accuracy and fit of the various parts of his work and the proper building-in of same. Protect trusses and keep under cover in transit and at the job site. Stack to ensure proper ventilation and drainage. Store under cover in a well ventilated area. Trusses damaged in shipment or at the job site shall be repaired or replaced at no cost to the Owner. Timber shall be sized according to engineering requirements. Minimum size shall be 6″ x 6″ in all directions. Timber species shall be Douglas Fir, Select Structural, S4S Or #1 & Better Douglas Fir, S4S, FOHC or Native Hemlock/Pine, Rough Sawn or S4S. Unless otherwise noted, all timber shall be per “Standard Grading Rules for Western Lumber” by the Northeastern Lumber Manufacturers Association. Records of grade marks and certificates indicating conformance with the Specifications shall be maintained by the Contractor. Exposed edges shall have a 1/2″ wide chamfer (S4S spec). Peg material shall be straight grained, all heartwood, knot free, and reaction free from Birch or Oak. Furnish and install all necessary hardware and metal shapes required for assembly and erection of the trusses. All steel shapes, plates, and tubes, unless otherwise specified, shall conform to ASTM A-36, as amended to date. Steel pipe shall conform to ASTM 53, Grade B. Where welding is called for, it shall be by the electric arc process in accordance with the American Welding Society’s Code for Arc and Gas Welding in Building Construction. All other steel shapes, plates, tubes, etc. shall be thoroughly cleaned and given one heavy shop coat of an approved red lead primer (black), well worked into all joints and open spaces. After erection, touch-up as required. Surfaces which are not accessible for field painting shall have one shop coat of black paint before leaving the shop. Bolts shall be zinc/galvanized with zinc/galvanized washers and nuts. Trusses shall be pre-finished on all surfaces and joints with one coat of Polyurethane for Fir, Minwax or equal for native material. Installation of trusses shall be in accordance with the details and notes on the Drawings, the approved Shop Drawings, code requirements, and the best trade practices. Joinery shall be in the best of the early English and early American traditions, designed for strength, shrinkage, checking, and twisting. **OPTIONAL** Metal connections shall not be used unless required by the structural design, and, in those cases, must be concealed and held at an absolute minimum, meeting the Architect’s approval. All workmanship shall be of the very highest quality. Or steel as detailed on Structural Drawings. All joinery shall be accurately cut so as to make a neat, snug fit. Truss components and assemblies must be checked for dimensions and anchorage accuracy before erection. Temporary bracing and guy lines shall be provided to adequately protect all persons and property and to insure proper alignment. Padding or non-marking slings shall be used, and corners shall be protected with blocking. The assembled trusses shall be reasonably straight, plumb, level and square. Portions of the structure not adequately braced by design shall have temporary braces until the decking is applied. All joints shall be reasonably tight. Tools used to drive or pull joints together shall not permanently mar the finished surfaces of the trusses.